Apple’s iPad lineup doesn’t always get the attention it deserves. Often overshadowed by the iPhone 8 rumors is an all-new iPad family that we’re expecting to be announced at some point this year, likely sooner rather than later. Last weekend, we told you all about the new iPhone 8, but now it’s time to give the iPad the same treatment. Headlining this year’s iPad refresh appears to be a completely new 10.5-inch iPad Pro model. Rumors of such a device first began back in August, when reliable Apple analyst Ming-Chi Kuo stated that the 10.5-inch iPad would sit in between the 9.7-inch and 12.9-inch models. What is expected to stand out about the 10.5-inch model, however, is its design. The device is expected to feature a near bezel-less design, which means despite having a larger screen, it will be the same physical footprint as the 9.7-inch iPad model. Additionally, the 10.5-inch iPad is said to feature a virtual Home button. Other details about the 10.5-inch iPad’s design are unclear at this point, but it’s expected to feature an LCD panel, as opposed to OLED which is reportedly coming to the iPad lineup sometime in 2018, but not this year. In terms of specifications, the 10.5-inch iPad is expected to be powered by the A10X processor, which is the next step up from the A10 processor found in the iPhone 7. Such a move would follow Apple’s normal pattern of saving its more powerful, but more battery intensive, “X” processors for the iPad. In some ways, the 10.5-inch iPad will offer a peek at what’s to come with the iPhone 8 later this year. Both devices are said to adopt nearly bezel-less displays and fit a larger screen inside of a familiar form-factor, while also ditching the Home button. The rest of the iPad Pro lineup is also expected to be upgraded this year, though likely in a more iterative fashion. As of right now, the only changes that are expected with the new 9.7-inch iPad Pro and 12.9-inch iPad Pro are speed and performance improvements. Most recently, a report claimed that the 9.7-inch and 12.9-inch iPad Pro models will be upgraded this year with under-the-hood speed improvements. Much like the 10.5-inch model, these variants are said to adopt the A10X processor, which will allow for improved speed and graphics performance. Something else worth noting is that the 12.9-inch iPad Pro currently lags behind the 9.7-inch model in a few ways. As we outlined in our comparison post last year, the 9.7-inch model features a 12MP rear camera, while the 12.9-inch model has an 8MP camera. There’s also discrepancy in the front camera, with the 12.9-inch model again lagging behind the 9.7-inch model. The smaller variant features a 5MP camera with Retina Flash, while the larger model features a 1.2MP camera and no Retina Flash. Furthermore, the 9.7-inch iPad Pro features an f/2.2 aperture and support for 63MP panoramas, while the larger model features an f/2.4 aperture and support for 43MP panoramas. The smaller model also has True Tone flash (an iPad first), which offers a mix of both white and amber LEDs to improve white balance. The 9.7-inch iPad Pro includes support for Live Photos, while the larger model does not. Apple also says the smaller model offers “improved local tone mapping and improved noise reduction,” while the larger model does not. A new budget 9.7-inch iPad? Something else that has been rumored is a new entry-level 9.7-inch iPad, though things here are pretty unclear. Currently, Apple sells the 9.7-inch iPad Air 2 for $399, so the likely scenario here is that the new model will be a continuation of that model. 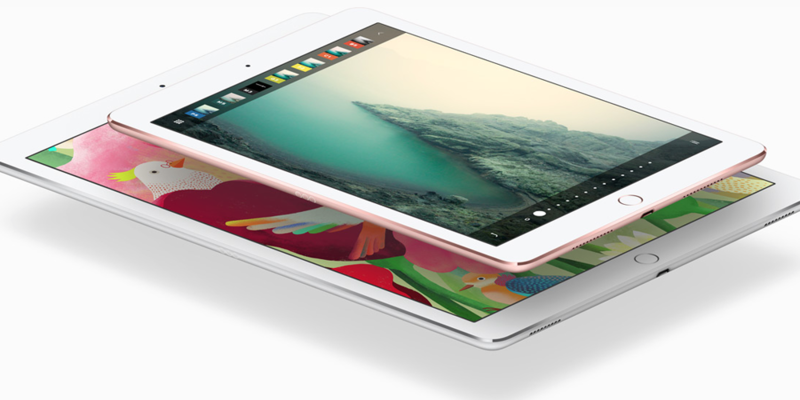 The 9.7-inch iPad is said to use the same A9X processor that the current iPad Pro uses. Again, this will likely be an iterative upgrade focusing on performance improvements and keeping the cost as low as possible. This model will likely be targeted towards education markets. Given the lack of information regarding this budget device, it’s altogether possible that Apple has scrapped the idea, so we’ll just have to wait and see. Right now, it seems as if the iPad models that are nearest on the horizon are the refreshed 9.7-inch and 12.9-inch iPad Pro models. Those devices have been rumored to be ready as soon as this month or next month. Theoretically, these upgrades on their own wouldn’t warrant an Apple press event, but rather could be announced via a press release. As for the 10.5-inch model, things are a bit more foggy. Originally, it was said that this model would be released alongside the other models, but now it appears that may not be the case. Earlier this month, developer analytic data showed new iPad models start to appear in usage logs, suggesting that a launch was imminent. What the data also showed, however, were some models running iOS 10.3 and some running iOS 11. Currently, iOS 11 isn’t expected to be released until September at the earliest, implying that perhaps Apple might be saving at least one iPad for a release later this year. We’ve also heard that the 10.5-inch model may be released sometime in May or June, and announced at the same time as the 9.7-inch and 12.9-inch models. In this case, we likely would see an Apple press event rather than a press release. The important thing to note here is that while it’s clear Apple has new iPads in the pipeline, it’s not explicitly clear when we will see them. Nevertheless, we know they’re coming. As you can see, there are still some things that are unknown about the new iPad lineup, but the general idea has been consistent throughout recent months. iPad rumors are generally more uncommon than iPhone rumors simply because it’s a smaller-scale product and thus the supply chain is as affected by a new iPad model as much as it is by a new iPhone. Looking further ahead, it’s been rumored that the iPad lineup will switch to OLED in 2018 and perhaps adopt some sort of flexible display technology. Again, those changes are further down the line. What do you think of the rumored iPad lineup changes for 2017? Let us know down in the comments.